Once upon a time a friend sent me a lovely sheet of vintage car scrapbooking paper. I had gold embossed stickers on hand from a Custom Quilling kit, so combined the two and decided to add punched flowers in the center of the heart to tie everything together. The foil is the heavy, textured kind that comes on yogurt containers. I find I use it pretty often as a craft supply. To give a punched flower a bit of dimension, hold it on a fingertip or place it on your palm or a computer mouse pad. Rub in a circular motion with the top of a glass head pin or the end of a small paint brush... something rounded. This will cause the edges to cup so it looks more like a natural flower. The two upside-down flowers on the far right show the definite curve that results. I dusted some older-than-I care-to-remember eyeshadows in rose, lavender, and blue onto the flowers with a little brush. They stuck surprisingly well to the textured surface of the foil, as would true chalks that are made for coloring stamped images. I like the way the colors complement the hydrangeas on the car, and have to say it's fun when a play session goes well - definitely not always the case! Totally brilliant! So very creative! Your blog is wonderful - I have spent way too much time reading your posts since finding you this week. Love the card! lovely card, love the idea on the little flowers they turned out great! Love the vintage look of that card. The foil flowers are a great touch. I also stumbled onto using foil that I'd punched in my crafts after trying to sharpen my punches a little too. If you punch wax paper it's supposed to "oil" the punch which might also help it work better. You had me at "yogurt containers." I LOVE--*LOVE*--this one. The eyeshadow trick is genius. Those flowers are adorable, and how clever to use eye shadow to color them! This card looks awesome. You have such great ideas ,the foil flowers look great .Such ideas are great help when you are in a place with limited craft supplies. Oh my, Ann. I love how you did this card and used the paper given to you. The heart sticker and punched flowers make it look dimensional. Pretty! Sarah, I used a glue called Crafter's Pick, The Ultimate as it seems to hold metallic or plastic bits better than my usual quilling glue. Meg, good idea about trying waxed paper - I'll do that. just lovely..have never seen that punch..lol will have to look for it.. those are perfect little flowers for that heart.. 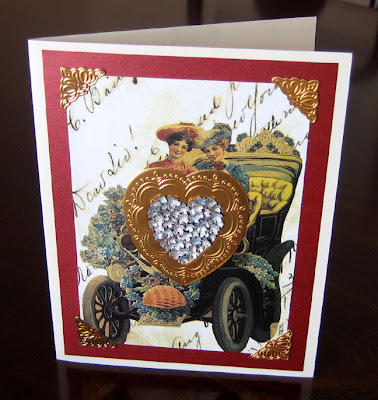 I love this card Ann and I love the idea of using your old eyeshadows. I have thrown so many out in the past but now I will recycle them. Wow all those tiny flowers, you have more patience than me, they look just beautiful in the heart. Stunning!!! I had no idea they had a punch like that to get the teensy flowers. I've been using the ones left over from a fiskars scallop edge punch but the one you used would save paper in a big way. LOVE how you used the head of the pin & they look ever so lovely on your gorgeous card.